Association, National Association of Secondary School Principals, National Science Teachers Association and more. BrandAdvantage has produced and supplied millions of bags such as totes, backpacks, briefcases and computer bags for national meetings. In 2013, a local school district was instituting a one-to-one Chromebook program. The superintendent and technology director contacted the founder of the company, Mark Morris, and asked him to design a case to protect their school’s investment. The one thousand Chromebook cases created for Westwood High School inspired a whole new product line. This custom case has been refined and enhanced to protect Chromebooks exclusively. We are now producing cases for school districts throughout the country and our custom case has been named “The BookCase”. The use of Chromebooks in schools is exploding and we are committed to providing custom cases to protect the hardware and the school’s investment. 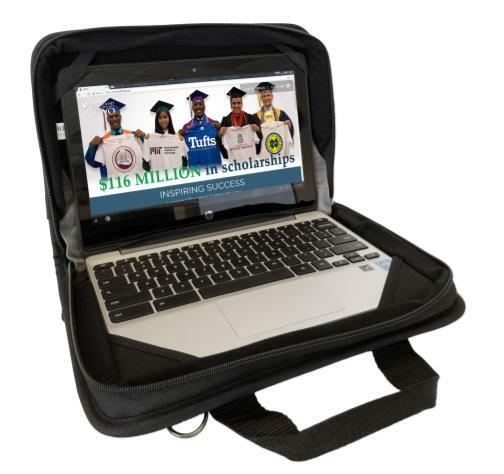 BrandAdvantage has transferred its expertise producing tailor-made bags for association’s national events, to customizing Chromebook cases for school districts. Much like the Chromebook device itself, “The BookCase” is designed for schools and is more affordable than its competitors. With customizable options selected by your school, BrandAdvantage will help to design and create the case to protect your educational investment.